When used in conjunction with other dietary changes, the use of herbs for acne treatment can have a positive effect in controlling and suppressing this skin condition. Although there are two main types, acne rosacea and acne vulgaris, the dietary requirements and recommendations for both are quite similar. 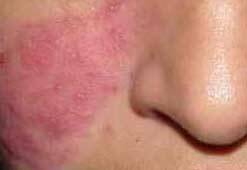 Rosacea is a skin disease that causes redness and swelling on the face, beginning with redness in the centre of the face that gradually covers the cheeks and chin. As it progresses, small blood vessels and tiny pimples begin to appear on and around the reddened area. For some reason women get rosacea more than men and usually between the ages of 30 and 50 and is a classic symptom of poor digestion and absorption. It has also been linked to emotions such as anger, fear and stress. This form of acne results in spots, whiteheads, and blackheads and, in the most serious cases, cysts and abscesses that can leave pitted scars when they heal. 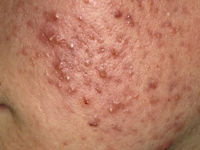 Most adolescent boys and girls get this form of acne at some point, but usually only mildly, and it usually clears up after the teenage years. Usually caused by the over-production of the male hormone testosterone, which is produced by both sexes, it makes the glands in the skin work overtime causing the pores to become blocked and infected. What Are The Best Herbs For Acne? IMPORTANT: Consult a doctor, physician or specialist before taking any herbal remedy as they may worsen some existing conditions. Burdock root and dandelion leaves help to cleanse the blood. They can also improve the quality of the skin by removing bacteria. Aside from trying the above mentioned herbs for acne, the following recommendations will benefit too.